One Giant Leap – For athlete and mentor, a shared journey culminates in a singular propulsive moment. For athlete and mentor, a shared journey culminates in a singular propulsive moment. Call it the track athlete’s dichotomy: Doing something extraordinary starts with doing the routine. 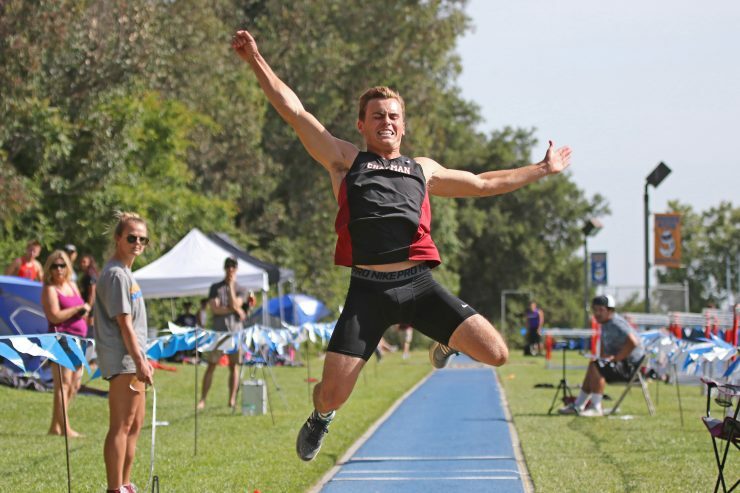 For Chapman University long jumper Mitchell Bouldin ’17, each competitive leap begins the same way – by measuring off 18 full strides from the takeoff board. Then he shakes out his limbs and draws three deep breaths, shedding tension with each exhale. In his mind, he hears the voice of his Chapman coach, former Olympic long jumper Anna Wlodarczyk. “I think I’ve heard her say ‘relax’ about a million times over the past two years,” Bouldin relates. The word runs through his mind like a mantra as he narrows his focus, controls his pulse and visualizes the longest jump of his life. It’s the SCIAC conference championship meet, and Bouldin stands on a spongy runway, peering down to the leveled sand in the landing pit. He has a feeling something special is afoot. 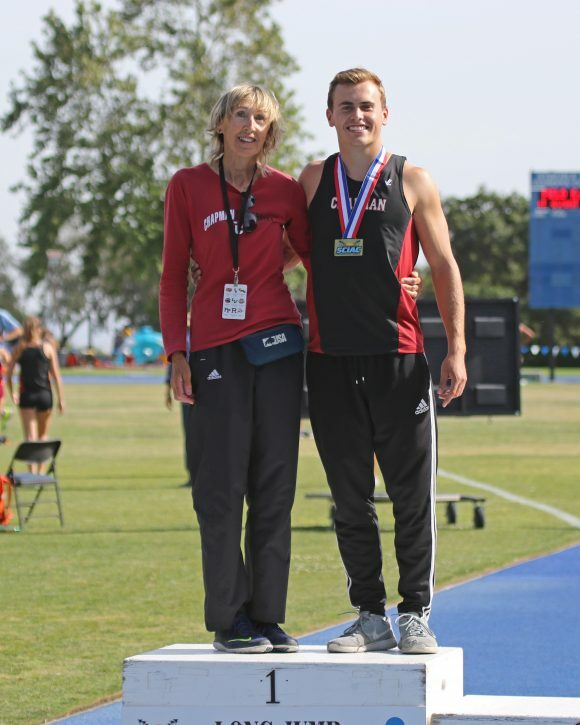 Never mind that he came to Chapman as a baseball player, that he had never competed in track before meeting Wlodarczyk one day when he was just looking for an activity to maintain his fitness. As he prepares for this jump, he isn’t even thinking about the stress fracture in his foot, a remnant from an injury suffered earlier in the track season. To his surprise, the moment seems free of any stress at all and instead pulses with confidence built over two seasons of drills and coaching reinforcement. Rocking back, Bouldin begins his run with one long, purposeful stride, and in a flash he reaches full speed, his final step landing squarely on the board. In the thwack of his takeoff there is a power he can both feel and hear. “It sounds like success,” he says. His goal is an arc of 23 degrees (precision is another watchword of Coach Wlodarczyk), and he’s in that range as the apex of his jump turns into descent. His feet land, sand flies and a buzz of recognition moves through the crowd. Bouldin quickly looks to his coach; the jump is good, but how good? Wlodarczyk cranes her neck to see over a judge’s shoulder as he measures. From beneath her floppy hat, she flashes Bouldin a knowing smile. “At that point, I knew I was going to win,” he says. Beyond the conference championship, Bouldin’s jump of 7.20 meters (23 feet, 7-1/2 inches) sets a school record and earns him recognition as SCIAC Field Athlete of the Year – a first for Chapman. What’s more, the senior’s jump is the longest in the Western Region this year, surpassing the second-best Division III jumper by more than four inches. Success is nothing new to Wlodarczyk, who was the 1980 European long jump champion and then won a host of medals as a masters competitor after she moved to the U.S. from Poland. During her 24-year coaching career at Chapman, she has helped 38 athletes set school records. Still, this achievement stands out because it comes in her specialty and in the final meet before her retirement as coach of the Panthers. Climbing atop the medal stand, Bouldin urges Wlodarczyk to join him. Soon, they will begin major new chapters in their lives. Bouldin, a kinesiology major, will graduate and begin work as a sports-performance trainer; Wlodarczyk will divide her time between her native Poland and the life she has built with her many friends in Southern California. But in this moment there is triumph – the culmination of a shared journey – so what better way to celebrate than for a champion to honor his mentor? 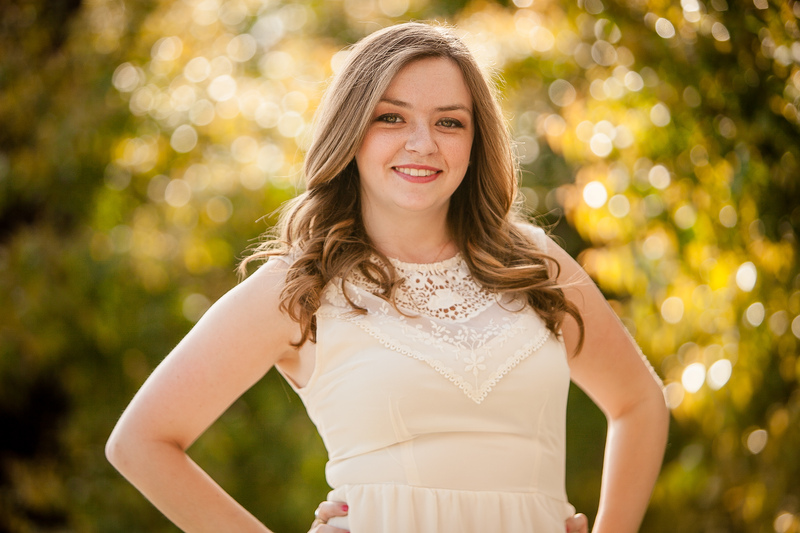 While a student at Chapman, Michaels envisioned herself running her own magazine someday. 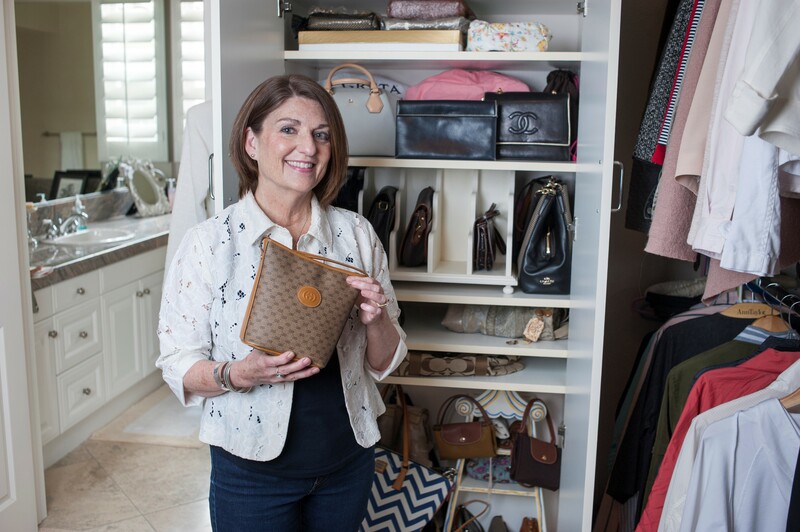 “So it was great to get back into print work and to reconnect with what was my passion,” she says. For our story on the record-setting long jump of Mitchell Bouldin ’17, Michaels “wanted to take static pictures and convey a sense of movement, like he was jumping off the page,” she says. After running through a number of ideas, she ultimately used perspective to create a line from Bouldin’s first step through his leap into school history. Michaels says she learned a lot from all of her Chapman graphic design professors, including the value of collaboration, which serves her well in her work for Webydo, providing tools for Web designers. Michaels’ full design for “One Giant Leap” can be viewed below, online or on page 4-5 in the summer 2017 print issue of Chapman Now. 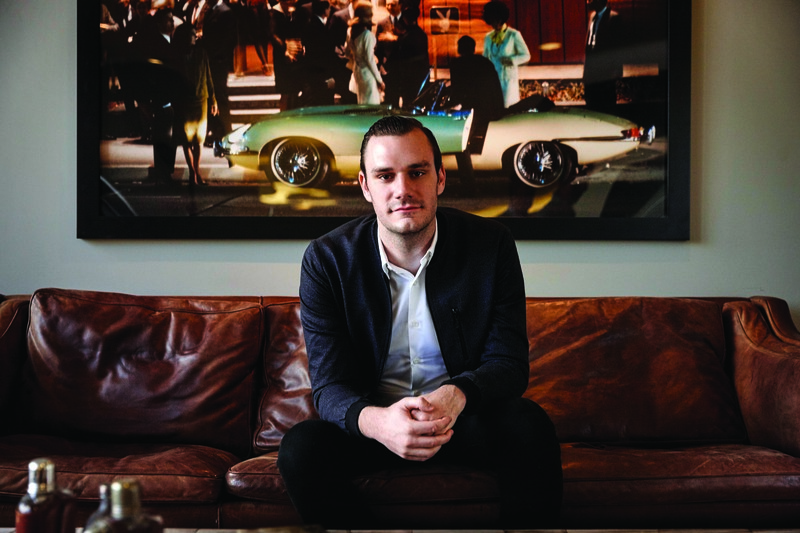 Geniuses Don’t Look Like Me – Before reaching the peak of success at Chapman, the Cheverton Award winner first had to scale a mountain of self-doubt.